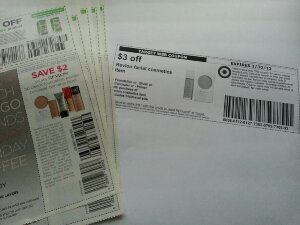 Recently my sister needed to buy more of her Revlon face makeup and we knew we were shopping at Target. So she asked me to check if I had any coupons that would work. I quickly pulled up a coupon database and typed in Revlon. Luckily, I found a $2 off manufacture coupon and even better I found a $3 off store coupon for a total of $5 off of something she was already going to buy! Not bad for 2 minutes worth of work. Minimum wage for an hour isn’t much more than that. Sometimes taking a minute to stop and search for coupons for something you need to buy anyways can really save you money. So before you head to the store next time to buy X-item that you need, you might want to take a minute to look for a coupon or two.